You’ve been making payments on your credit card each month. However, you’ve just got a letter from your credit card provider saying they’re going to increase your monthly repayment, or suggested you do so. Why? If you’ve been paying more in interest and charges than the balance for 18 months or longer, this is classed as ‘persistent debt’. A persistent credit card debt takes a long time to reduce because all that’s being paid off is the interest, or at most a very small part of the balance. Increasing your monthly payment means you’ll pay more off what you owe, and this’ll help you clear the balance quicker. If you’d like some advice on persistent debt over the telephone, please call StepChange Debt Charity on 0300 303 2517. We’re available Monday to Friday 9am to 5pm. How much of my monthly payment covers my actual balance? If you repay more each month, more of your money will go towards your balance and you’ll pay off your debt quicker. Try the card costs calculator now to find out how much quicker you could pay off your persistent debt by making increased payments. To find ways to pay your debt off quicker, read our persistent debt guide (PDF). They may choose to suspend interest and charges on your card for a period of time. If you’re considering moving your persistent debt to a loan or card to another bank, let your current provider know. They may be able to offer you a better deal. By doing this, you’ll see your credit card balance reduce quicker. Use the UK Finance credit card calculator to work out how much more you could pay each month to clear your debt quicker [please note: the calculator isn’t optimised for mobile phones, so you may have an easier time using it on a desktop PC]. This can range from putting your persistent debt balance to a cheaper credit card, or taking a look at your budget to see how much extra you could pay towards your debt each month. Our persistent debt guide (PDF) has more practical tips on how to pay your credit card off quicker. How long will it take to pay my credit card off? Let’s say that you owe £2967 on a credit card. 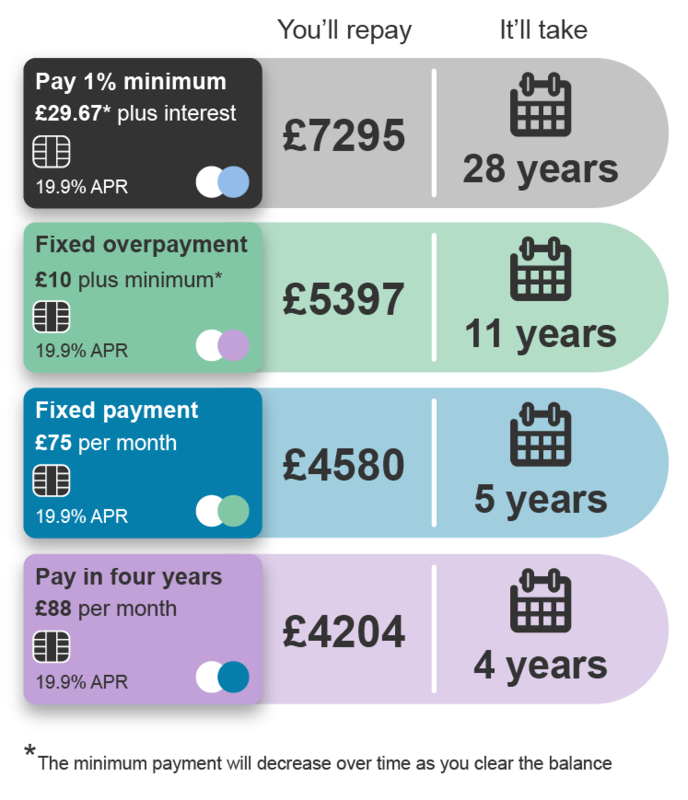 The graphic below tells you how long it could take you to pay off this balance by only paying the minimum. Depending on how much you can increase your monthly payment by, there’ll be a drastic reduction on the total amount you pay off over time. By repaying more each month, you could dramatically reduce your credit card balance and save money and time. How much you need to pay depends on your interest rate. You also need to understand how much you can afford before committing to an increased amount each month. (please note: these figures are based on estimates and can vary depending on your interest rate). If you continue to make nine further minimum payments after receiving your persistent debt letter, you’ll get another reminder to pay more to your credit card balance. Some credit card companies are changing their terms and conditions (T&C’s) to increase the minimum payment in order to get customers out of persistent debt. If this happens to you, please be aware that if you don’t pay the increased amount each month you’ll then be in breach of your T&Cs. This could result in additional charges being applied to your balance and your card might even be suspended. What are the chances that my credit card could be suspended? While your provider would only suspend your card as a last resort, ignoring them or not making any attempt to increase your payments could make suspension more of a possibility. If increasing your monthly payment isn’t an option, your provider may suspend the card to prevent your balance increasing. How can I get out of persistent debt? Struggling with cash? Not sure what to do? Pay the same amount each month – choose an affordable amount above your minimum payment and stick with it. Pay your minimum payment, plus a fixed amount each month – Paying a few extra pounds every month can make a huge difference. UK Finance has a calculator that can help you work out a fixed monthly payment amount. Make one-off additional payments when you can afford them. You’ll still need to ensure you pay at least the minimum payment every month to avoid breaching the terms and conditions of your card. Our persistent debt guide (PDF) has even more ideas on how to save money and boost your income. If you feel that you rely on your credit card too much, there are several alternatives to credit cards you could consider. How can I make savings in my budget to pay my debt off quicker? Can you commit to following some of these money-saving tips so you can repay more of your credit card bill? Don’t forget to check the money-saving section of MoneyAware for more great ideas. I can’t increase my credit card repayments at the moment! When you filled in your budget you may have found that you’ll struggle to pay your other bills and debts when your credit card repayments increase. But that’s understandable: only being able to pay the minimum can be a sign that you’re struggling financially. We provide free and confidential advice to thousands of people struggling to repay their credit cards, loans and other bills. We’ll look at your whole situation and give you information on how best to deal with any debts you’ve got. If you’re unsure whether or not you need debt advice, our 60-second debt test can tell you in just a few minutes. Need more money-saving, money-making and budgeting tips? Subscribe to our monthly email newsletter via the box below and you’ll get our best budget and money tips straight into your inbox.